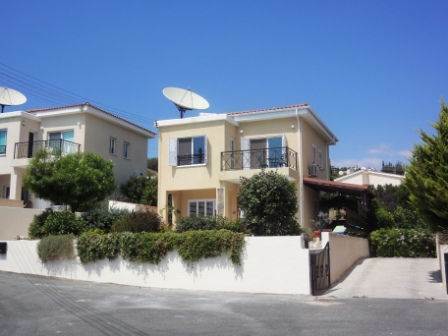 Cyprus Property Blog by Cleo : Price Reduced - 3 Bed Villa in Tala with Title Deeds - NOW SOLD! • 111 sq. m., 3 bath, 3 bdrm 2 story - €249,000<> EUR - Title Deeds - NOW SOLD! Tala, Paphos, Cyprus - This well maintained 3 bedroom detached villa is located in a quiet cul-de-sac in the popular village of Tala, which has a wide range of local amenities, including a quaint village square with a good selection of tavernas and coffee shops. The property features an open plan living room nicely divided into lounge, dining area and corner kitchen, and a guest cloakroom. The lounge has an open fireplace, ideal for those chilly winter nights, and the kitchen is well equipped with granite worktops, built-in oven, electric hob and extractor fan, dishwasher and fridge freezer. There is access from here to the rear garden where there is storage space and the housing for the washing machine. Upstairs there are 3 double size bedrooms, all with fitted wardrobes. The master bedroom has an en-suite shower room with vanity unit, and the second and third bedrooms share a family size bathroom also with vanity unit. Bedroom two has patio doors opening on to a balcony with lovely sea views. Patio doors in the living space provide good sea views and easy access to a covered veranda and the pool terrace. At the side is a pergola which is an ideal space for outdoor dining. Ample parking is catered for with the gated driveway.